While the French language utilizes roman characters, the French accents often perplex people when it comes to typing them on a computer. Fortunately however the ability to type the accents is built into OSX, so you can type them with no configuration or extra software required. 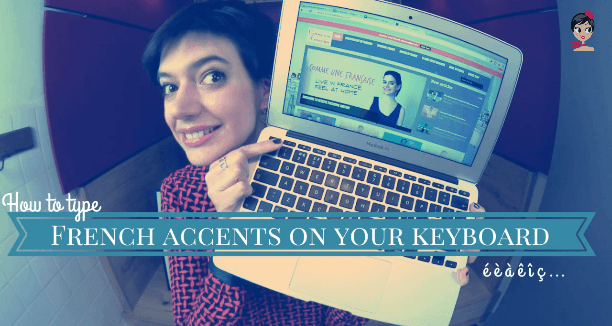 This article will explain to you step-by-step how to type all of the different French accents on your MacBook Pro – and although the article was written for MacBook Pro users you can type French accents the same way on most modern Macintosh computers running OSX. We’ve created a handy infographic to use as reference when you can’t remember exactly how to type french characters on your mac keyboard. Feel free to bookmark it and share it with your friends! •Acute Accent ( é ): Press “e” while holding the “option” key, take your finger off the option key then press “e” again. •Grave Accent ( à, è, ù ): Press ” ` ” while holding down the “option” key, then press either “a”, “e” or “u”. to put a Grave accent above the appropriate letter. •Cedilla ( ç ): Simply press “c” while holding down the “option” key. 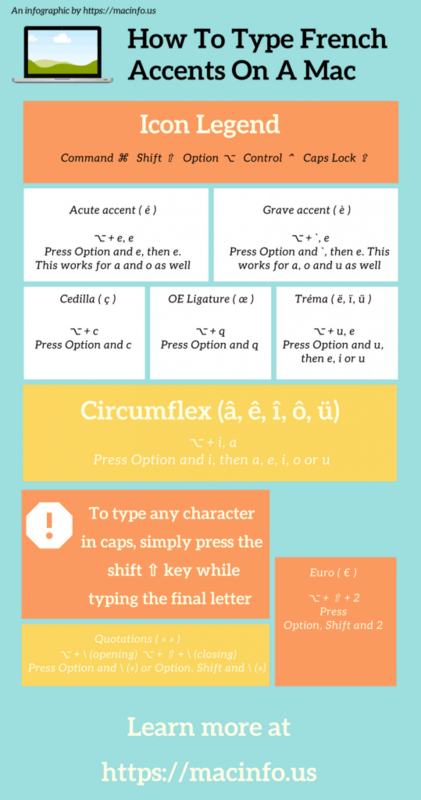 •Circumflex ( â, ê, î, ô, ü ): Press “i” while holding down “option”, then press either “a”, “e”, “i”, “o” or “u”. •Tréma ( ë, ï, ü ): Press “u” while holding down “option”, then press either “e”, “i” or “u”. •OE Ligature ( œ ): Simply press “q” while holding down the “option” key. Note that to type any of these accented letters as capital letters simply hold down “shift” while typing the final letter (for example, you could press “i” while holding down “option”, then hold down “shift” while pressing “a” to get ” Â “. Although they aren’t exactly French accents, there are a couple of other symbols that you may want to know how to type when you’re dealing with the French language on your MacBook Pro. There’s the Euro symbol (€), which you can easily type on your American keyboard by hitting “option”, “shift” and “2”. There’s also the French quotation marks, which differ from the western ones – French quotation marks look like «this». The opening one ( « ) is typed by pressing “option” and ” \ “, while the closing one ( » ) is typed by pressing “option”, “shift” and ” \ “.